Have you ever wondered how the professionals score at strike rates of 150 runs per hundred balls without resorting to risky slogging? The modern approach requires a total change of mindset from the traditional techniques and tactics. No longer can you afford to pat back good length balls and hit half volleys for 'just' four. You need to maximise the run scoring from every ball while also minimising your chances of getting out. That's why this course exists: To take you past the coaching manual and into the best ways to improvise from the first ball to the last in the short format. Find out the ways to position your body for safe, fast scoring that you won't find in the coaching book. Learn the techniques for how to work length balls into gaps or hit them over the rope. Discover the essential drill for turning a half volley into a six. Master the one movement you need to score all round the ground at the death. Play the shots that are lowest risk against swing bowling. Hitting boundaries with controlled shots and good technique will lead to Twenty20 batting success. The only place online that you can learn how to do that is this course. Click buy to get instant access and start improving your Twenty20 batting right now. 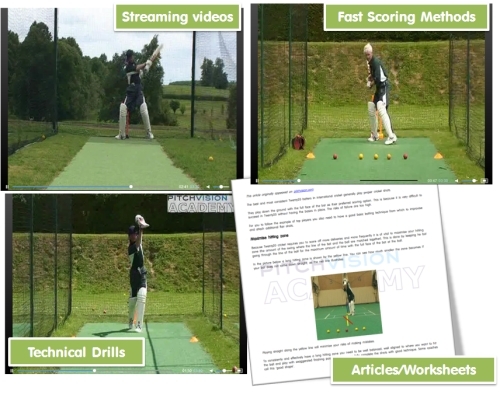 Learn how to work accurate bowling into gaps or score boundaries. If you want to clear the boundary you need to get under the ball. The safest place to hit it it straigh back over the bowler's head. This video shows you how. (2m 28s). Good swing bowling is difficult to play, but in Twenty20 you have little time to play yourself in, this chapter shows you how. Download and print this sheet to take to the nets and use it to work on your weaknesses in Twenty20. Download this article explaining the best ways to score quickly while minimsing risk. Discuss batting with other Academy members here.